How Emerging E-Payment Methods Affect the Intercity Bus Industry? Many position long-distance bus industry somewhere between classic travel and commuting/public transport industry. Yet, at least one thing clearly distinguishes this industry from public transport – the way passengers buy and pay for their tickets. In the public transport industry, contactless smart card-based solutions are widely accepted as the modern way to organize fare collection. On the other hand, intercity ticketing often includes more complex fare structure and a higher average cost per transaction. Additionally, in most cases, it requires including specific seat allocation with the ticket reservation. Buying intercity travel tickets resembles much more a typical e-commerce transaction like buying concert or movie tickets, rather than public transport ticketing designed for daily commuting. Thus, when talking about electronic payment methods related to intercity reservation systems, we can follow the trends of the general global e-commerce industry, instead of public transport related fare collection industry. Which in fact has evolved into a very specific niche payment industry itself. Yet, for historical and other reasons, e-commerce payment itself also doesn’t mean the same thing in each region of the world. In this article, we decided to pay attention to existing and emerging online payment methods contributing to the digital transformation of intercity bus industry sales channels. 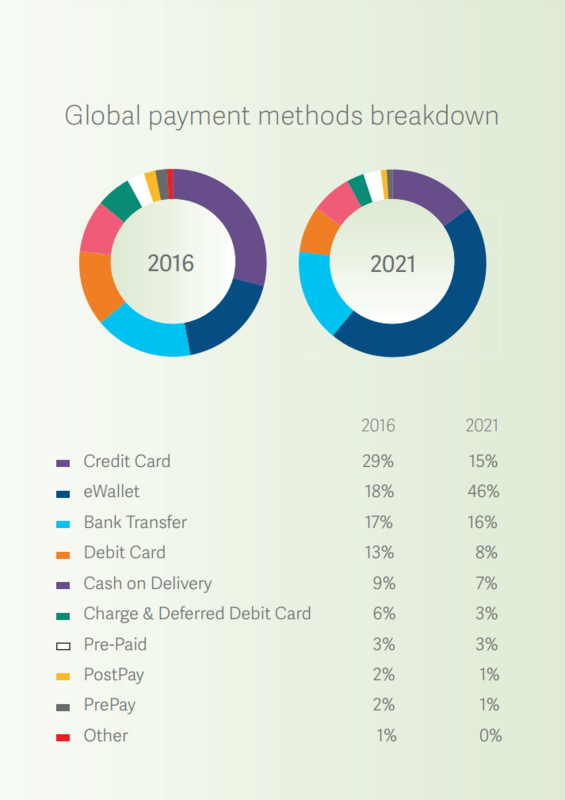 According to WorldPay Global Payments Report, the main methods to pay for the products in global e-commerce are still related to physical cards in our wallets. When combining different credit and debit cards, they made up to 49% of global online payment methods in 2016. Yet, according to the estimations, card-based e-commerce payment methods are in strong decline against emerging (and existing) eWallet solutions like PayPal and AliPay and continuing growth of direct bank transfers. As mentioned before, intercity bus ticketing usually involves some sort of advance booking of the seat. If there’s no convenient way for passengers to do this procedure, either because they don’t have a bank card or operator doesn’t provide e-commerce solution, they will opt for better alternatives. Taking this into account, emerging alternative electronic payment solutions will certainly have a positive impact on this industry as it will act as an enabler, pushing more passengers to opt for booking online. Especially in regions where so far the amount of unbanked cash-based customers remains high. As a result, it can potentially reduce the costs related to brick-and-mortar sales points, while increasing the overall satisfaction of passengers, and boosting the popularity and turnover of the intercity bus industry in general. Let’s now dig deeper into some of the existing and emerging electronic payment methods offering alternatives to card-based e-commerce payments. Digital wallets are exactly what the name says – an account/service to store your money with the goal to make digital transactions. The ease of signing up for a digital wallet has helped to increase the popularity of them significantly. After making a purchase at an e-commerce site, customers who don’t have a digital wallet can be prompted to sign up for one. Compared to opening a traditional bank account, this is much easier and more convenient way to start making purchases online. Wallets have also the capability to fill in required forms using data the user has already assigned when signing up for the wallet. This is especially beneficial for the travel industry, where sometimes quite a lot of data is needed to make a reservation. This again improves the user experience and flow of the purchase. Another advantage of digital wallets is that operators can access funds received via digital wallet almost immediately, which is not always the case with credit card transactions. They can also avoid the costs and fees associated with credit card transactions. In most cases, cost structures of digital wallet providers don’t need highly complicated and certified security measures related to credit card transactions. To bring the best example of what a digital wallet is, the most known one is PayPal but the market is changing quickly and new players like Google Wallet, Dwolla, WePay, etc. are growing rapidly. Mobile wallets will play an especially important role in digitizing the intercity bus industry. Considering that globally, mobile internet consumption has surpassed desktop-based browsing with a market share of 52% and 43% respectively, it’s no surprise that whole e-commerce and payment industry has had to accommodate for that change. With mobile phones being usually personal and not shared devices, it’s relatively safer and easier to store and use digital, including a PIN and biometric (fingerprint, Face ID etc) authentication features. Consequently, paying for your intercity bus bookings will become much faster and smoother, improving online booking conversion rates. Some of the most known mobile wallets include Apple Pay, Samsung Pay, and Android Pay, which are exclusively mobile apps. In Africa, most widespread mobile wallet called M-PESA, which is operated in co-operation by some of the biggest telecom companies (Safaricom, Vodacom etc), has taken up a significant amount of mCommerce (mobile electronic commerce) market share. Of all the alternative payment methods gaining eCommerce market share, bank transfers are proving to be the most interesting both in terms of their growth and technological evolution. According to WorldPay Global Payment report, eWallets remain the global payment method of choice for eCommerce and will continue to grow in popularity, but bank transfers will make substantial gains over the next five years. They will surpass both Credit and Debit Cards in popularity. In fact, they are expected to become the second most popular payment method globally by 2021, with an eCommerce market share of 16.5%. In the established eCommerce markets of Western Europe, many consumers already have bank accounts and many options for payment methods. People value the convenience of only having to remember their online banking details rather than the information needed when paying by card. Also, as bank transfers are instant there is also no concern about having available credit or needing to pay a bill at the end of the month. Bank transfers are also an attractive option for operators wanting to maximize the gain of their online booking systems, as there is generally a lower cost of payment acceptance than for payment cards. This has made them an appealing option to offer alongside eWallets and Credit and Debit Cards. Post-pay solutions are somewhat similar to credit card payments in a sense that customers don’t necessarily need to have money on account to pay for the purchased item. When customers have an account with a post-pay service provider, they can identify them at the eCommerce store (usually very lightweight identification) and receive the item on the credit of the payment service provider. After the purchase, the client gets an invoice for the purchases and can choose the exact time when will they repay for the item to the payment service provider. They can also choose to slice their purchases into several consecutive payments (pay over time). The main value for the merchants when using post-pay solutions is that they don’t need to take the risk from customers side for fraud, etc. This is all taken by service providers – merchants are guaranteed to receive their payments for delivered goods. Post-pay solutions are specifically on a rise in countries where penetration of internet is high while payment behaviour among society is historically better compared to developing countries. Examples of such solutions are well known in Scandinavia, UK, and Germany. One of the most innovative post-pay providers is Swedish Klarna, which uses the national ID number and IP address to verify the buyer’s identity and process the payment on behalf of the user. This means that the amount of data collected for payment is significantly reduced, thus streamlining the checkout process and reducing the number of abandoned shopping baskets. It goes without saying that such innovative payment providers have a significant positive impact on selling perishable products like bus tickets online. They provide many new ways to enrich the shopping and service experience by fusing together simple checkout, flexible credit options and payment insurance in one easily understandable payment experience. Carrier billing allows users to make purchases by charging payments to their mobile phone bill. This payment method is available to all smartphone and feature phone owners. The only thing needed to confirm payments is a device with a SIM card and some sort of agreement (pre-pay, post-pay, etc.) with the mobile carrier providing your mobile phone with their services. Direct carrier billing is different from other mobile payment methods (mobile wallets, NFC solutions) because it does not rely on banking infrastructure. While the other payment methods are convenient for point-of-sale purchases, direct carrier billing provides arguably the best purchasing experience in mobile eCommerce. When purchasing bus tickets for example with a smartphone application, carrier billing provides a truly one-click payment experience. No need to collect any data nor enter any passwords or PIN codes, thus improving conversion rates for your booking system. The main advantage of carrier billing is arguably the wide reach and availability of such payment service. According to statistics, there are five times more mobile phones than credit cards in the world. For bus operators in emerging and often unbanked markets like Africa, India, and Asia, carrier billing could potentially provide the fastest and widest ability to provide online reservation capabilities. Yet, it must be also mentioned that the convenience of carrier billing in most countries also comes with a hefty cost for merchants. Mobile operators charge the merchants around 20% of the purchase value, making it arguably the most expensive way for bus operators, whose sales costs are historically under tight pressure, to sell their tickets online. Thus in many countries, operators add a “convenience fee” on top of their fares to cover such cost, leaving the choice for passengers either to pay this fee or queue up in the bus station to pay in cash for their tickets. On the other side, the overall market size of carrier billing is growing thanks to more and more mobile content being available (mobile applications, games etc). Hopefully, this will also reduce the costs related to carrier billing. When talking about e-commerce, we cannot avoid a fact that in regions like LATAM, where intercity bus industry itself is well developed and amount of internet users is booming, the average amount of unbanked citizens is still around 70%. Thus, to make a significant push towards an increase in e-commerce, alternative e-payment solutions have had to find clever ways how cash-based customers can use e-commerce solutions while paying for those services in cash. One of the most widespread e-commerce reservation methods is by receiving a code upon purchase that can then be used to pay in cash at the physical sales point. We cannot avoid a fact that in regions like LATAM, where intercity bus industry itself is well developed and amount of internet users is booming, the average amount of unbanked citizens is still around 70%. Payment methods such as PagoEfectivo in Peru allow to purchase online and pay for the goods later in cash. Similar systems exist also in Argentina (e.g. Pagofacil and Rapipago), and elsewhere in LATAM, and even in Europe. Specifically, Portugal, supported by the biggest ATM network of MultiBanco. This kind of payment method is certainly convenient for people used to dealing with cash. Although, it requires operators and their reservation systems to be able to hold the booking valid without receiving actual payment for much longer (hours) than it usually takes with direct electronic payment methods (average 15-20 min). This should be taken into account when selling perishable products like bus tickets/seats. The world of payments is very fragmented and getting more complicated - there’s no one size fits all in any region so you’ll need to do your homework on the best options for your company. Offering a wide choice of payment methods is important if you want to be accessible to people outside your region. Thus, we suggest opting for a solid payment gateway that would accept as big variety of payment types as your region of operations requires. In a tight competitive market like the intercity bus industry, every % of passengers counts. So it makes sense to have as wide array of payment methods as possible without the hassle of integrating with every single one of them. It will also be crucial for an operator to make sure the whole reservation process, including payment, is as pleasant and streamlined as possible. There’s no bigger turn-off for passengers than filling in forms, logging in, or registering on a website just to purchase bus tickets. Thus, new digital payment methods that reduce such hassle are worth the investment.